The opposition Maldivian Democratic Party’s (MDP) national council adopted a resolution today to organise a demonstration to mark Labour Day (May 1) and call for the protection of worker’s rights. The resolution (Dhivehi) submitted by the party’s Youth Wing Leader Aminath Shauna states that the MDP should organise a public gathering to call for the introduction of a minimum wage as well as for the Maldives to sign the International Labour Organisation’s (ILO) Convention on Occupational Safety and Health. The resolution noted that the MDP has been observing Labour Day since 2006 and that the Maldives became an ILO member state during the party’s three years in office. Moreover, it added, Labour Day or May Day was made a public holiday and a Labour Tribunal to resolve employment disputes was established in December 2008. 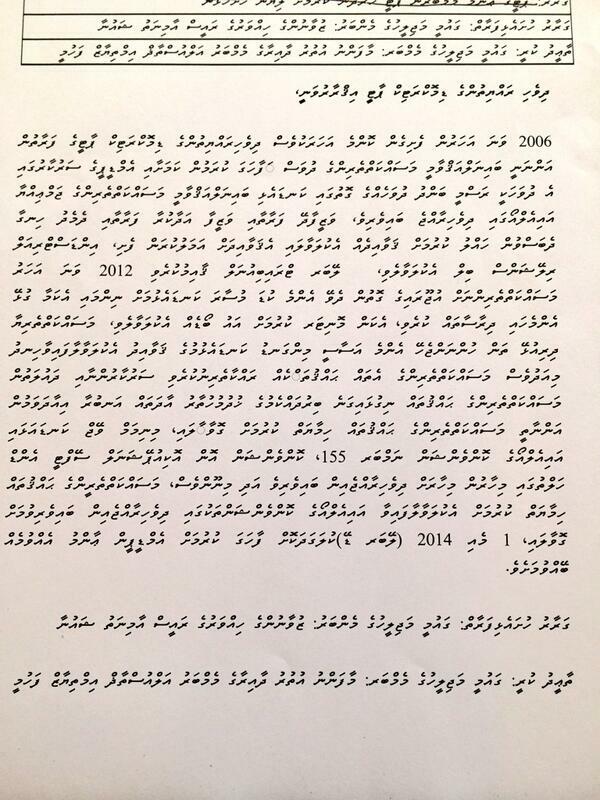 Prior to the ousting of the MDP government on February 7, 2012, the resolution stated that a decision was made to introduce a minimum wage and a board was formed to monitor the policy shift. However, “dictatorial habits” were returning with the current the administration allegedly violating the rights of workers and intimidating government employees, the resolution stated. The resolution was passed unanimously by the 37 members in attendance. Today’s meeting of the national council was chaired by former President Mohamed Nasheed, who was appointed acting president at the last meeting on April 1. During the debate on the proposal for marking Labour Day with a gathering, national council members expressed concern with the government allegedly discriminating against and intimidating MDP members working in the government. Members elected to various posts of the party were unable to participate in MDP activities out of fear of losing their jobs, national council members said. MP Rozaina Adam observed that the Maldives was the only country that provides social security benefits that were higher than some wages for full-time jobs. Noting that janitors at schools were paid MVR2,500 or MVR3,000 a month, Rozaina contended that a minimum wage would discourage hiring migrant workers as more Maldivians would be willing to take jobs currently occupied by foreign labourers. The introduction of a minimum wage would consequently bring down unemployment, she suggested. MP Ibrahim Rasheed meanwhile referred to the death of two port workers earlier this month when a crane’s wire snapped while unloading a container. Rasheed accused the government of negligence in the ports incident and contended that Maldivian workers across the country were treated as “slaves”. The outgoing MP for Maafanu South urged the party to follow through on issues of concern after holding demonstrations. Concluding today’s meeting, Nasheed announced that the national council will meet once a month. ‘Peace talks’ held yesterday between the government and the ‘youth movement’ the opposition Dhivehi Rayyithunge Party (DRP) has claimed were responsible for organising last week’s protests have reportedly ended poorly. Spokesperson for the opposition’s youth movement, Mohamed Ahusan, told Minivan News that their demands had been “dismissed” by the government representatives, who included Shauna Aminath from the President’s Office and State Finance Minister Ahmed Naseer. if there were any more protests,” he claimed. Shauna would not comment on whether she had suggested Gayoom be arrested, and said the government was unable to officially respond to the group’s demands as they had no formal recognition as an NGO, committee or other such body. “We met with four people who claimed to represent youth,” she said. “They presented a piece of paper they said was a youth proposal, but there was almost no discussion of what was on it. The group of four had “repeated the same messages being aired by [opposition] political parties: that the government had sold the airport to GMR, Dhiraggu to [Cable and Wireless], and that six people had control of the entire economy. Minivan News understands that the proposal presented by the group included closing the national offices, ensuring government offices were not open after working hours, sacking foreign consultants, closing utility companies running at a loss, and reviewing expenditure on foreign diplomatic missions. “The State Minister for Finance tried to explain the economic situation but it was not clear if they understood,” Shauna said. “We explained that it would be very easy for us to keep printing money,” Shauna said, adding that the government had instead introduced new taxes such as the corporate tax and tourism goods and services tax (TGST) to bring long-term stability to the economy, despite knowing that it would be very difficult and unpopular.